I welcome everyone to Laughing Dog. I hope the environment is such that people of all ages can experience and benefit from the freedom and power of yoga and other movement and healing arts. In teaching and practicing yoga and other movement arts for more than 40 years, I have been inspired and guided by many great teachers from a variety of traditions and styles. The most important thing I have learned is to follow my heart. So, I teach what I love and I love what I teach – be that yoga, pilates evolved, Nia, meditation or yoga nidra. In my classes, I hope to provide a space for self-discovery, where we can connect to the voice of our hearts, the optimal strength and suppleness of our bodies, the gift of life and the creativity of the moment. Prior to opening Laughing Dog I practiced psychotherapy full-time. I was trained in both traditional and holistic models with an emphasis on Body-Oriented and Spiritual/Energetic Psychology and the growing field of Positive Psychology. I am also a facilitator for TIMBo (trauma-informed mind/body) program and now part of the team that offers trainings and workshops nationally and internationally. All of this training, along with many years of meditation greatly informs my teaching. I gratefully thank all my mentors along the way and all the students and teachers at Laughing Dog for helping to create such a life affirming and supportive community. Jennifer’s vinyasa yoga was the first class I attended at Laughing Dog and what I realized very quickly was that Jennifer is truly a gifted teacher. I came to laughing dog at a very difficult time in my life and it was in Jennifer’s classes that I first realized I was beginning to heal spiritually, emotionally and physically. Jennifer is very kind, supportive and has so much compassion for her students and she intuitively knows what her students need. 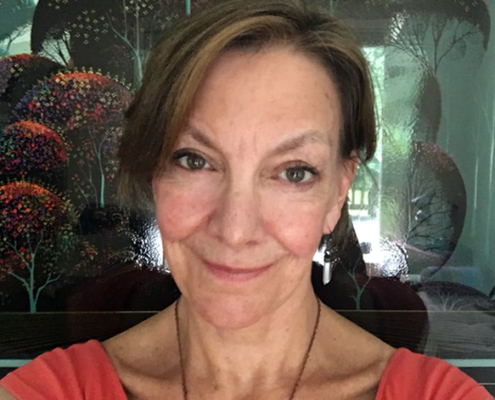 Jennifer combines her wisdom and years of experience in a way that her teaching seems to effortlessly combine the flow, spirituality and anatomical alignment of yoga in her classes. One of the most important things for me was that in Jennifer’s classes I always feel safe and that safety allows me to delve deep inside my heart, mind and body, which then allows me to learn, heal and grow in ways I never imagined I could.